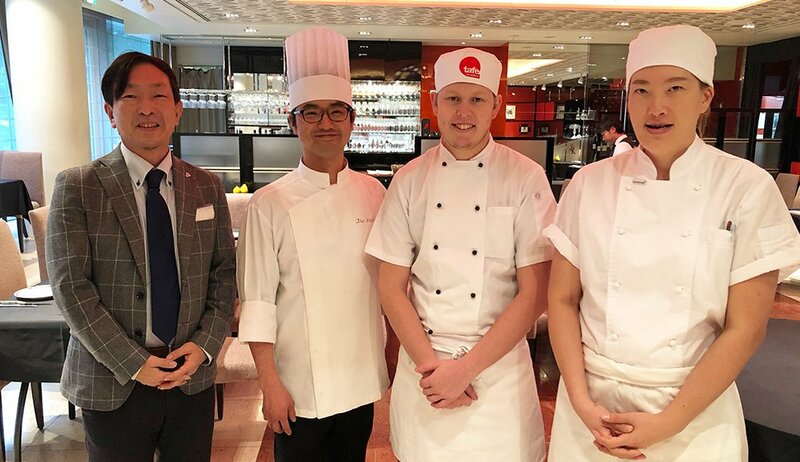 Two of our Hospitality students from Cairns, Anne (Hyemin) Park (pictured on the right) and Alec Stemmler (third from the left) recently travelled to Tokyo, Japan for a once-in-a-lifetime opportunity to work as interns at Iron Chef Sakai’s award-winning restaurant, La Rochelle. The students worked alongside experienced executive and sous chefs at La Rochelle, learning the art of French food with a Japanese twist right in the heart of Tokyo. Both the students were awarded the experience through a competition held by TAFE Queensland in September last year. Anne (Hyemin) Park is TAFE Queensland’s international student who travelled from Seoul, South Korea and enrolled in our Certificate IV in Commercial Cookery.